Using the best keywords that help your website content or your business. In other words, doing a good keyword research is the first step to increasing your traffic from search engines. We’ve seen many websites and we saw that the biggest problem is the keyword optimization. It’s obvious that not many people are led to those websites by the search engine if the content is not optimized. 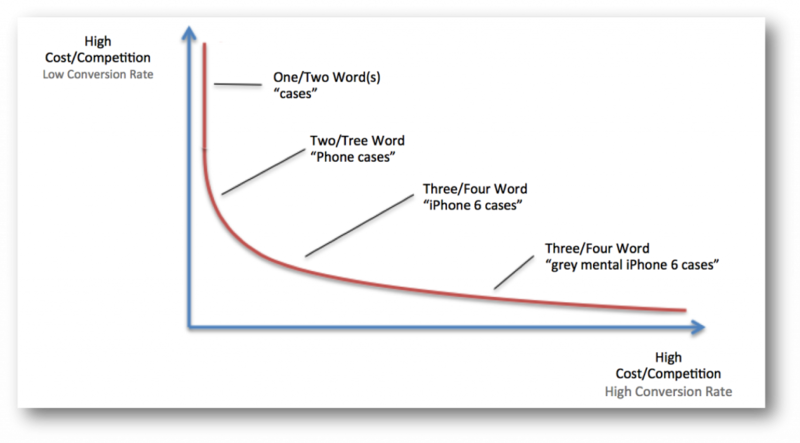 Keywords play a critical role in a content optimization. Keyword research is considered being part of the on page SEO, one of the first to-do parts when you start on page optimization. 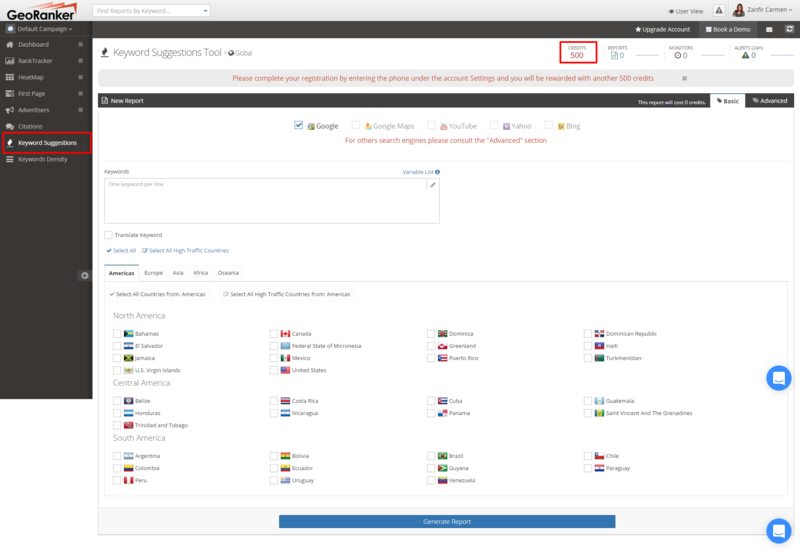 Why should you use our Keyword Suggestions Tool? Boost your Google Adwords Campaign. And because we are the only one that can provide a local IP for different areas from America, Europe, Asia, Africa and Oceania. I will explain a little bit later what each of them means for your website. Now we should see the different nature of keywords. There are different types of keywords, but I will classify them into two big groups: by keyword length and by user’s intention. They have a huge volume, but they are not always efficient because they do not provide users with relevant search results. Example: pizza, taxi, supermarket, etc. They have the biggest volume. Example: pizza hut, basketball games, half price tickets, film conferences. Though they have the lowest volume, they are a treasure for SEO and for increasing your website traffic or sales. Example: from where I can buy pizza hut on Sunday, what TV program shows the basketball game finals tonight, where I can buy half price tickets for the film tonight in my town, what film conferences are in my town this month. Google Hummingbird is the algorithm that the search engine uses to interpret the searches of a user. Since Google Hummingbird was updated – the search engine is focused on ranking sites for relevance – the popularity of the keyword. Each word in a query receives attention with Hummingbird. People have already started to search on Google like they are talking with a human being asking for information, so that Google Hummingbird is trained to understand the core of the people’s searches and give them what they really want. They are the head keywords. They are just telling us about the topic that users have an interest in. They look like body keywords. They help users to dig deeper into the search engine’s information. People use them usually to compare prices or products, but they are not always intended to buy them. Long tail keywords are informational. Users will type a whole phrase to find what they look for. They want not just to compare, but to buy. They want so much and so specific information because they are serious about purchasing a product or to find some information that is relevant to them. GeoRanker’s great advantage that can offer it to you is that the Keyword Suggestions tool uses local IP to generate the keywords you want. You can check this link to see what’s all about the track rankings with local IP addresses. You will see in the article, when you will follow the 5 steps to use the tool, that you can choose the zone you want for the keywords in need. You don’t have to worry about the fact that you are not there or use others tools to get a specific IP. GeoRanker provides this feature to make your website improving work simple. Like any other keyword research, just think about the target market and zone and let us make the searches for you. Specialists say that people who search on Google for something will get a better result if they type their locations. In other words, if you type the keyword followed by your location, the results will lead you to exactly what you want. But it is not true, in fact. You can type what you want to find without the location because the results will come back to you the same because of the single keyword you used. There is an article that explains to you better about Implicit and Explicit Keywords. Check the link and see how GeoRanker takes the shine off the Explicit Keyword. The simple keyword is called an Implicit Keyword and the one followed by the location is called Explicit Keyword. We all know that keyword research and keyword optimization tools are the most cost-effective actions to take for improving your website, so that you have to fix the keywords problem by using a keyword suggestion tool. GeoRanker is here to help you by providing a Keyword Suggestions tool to help you increase your traffic and sales on your website. 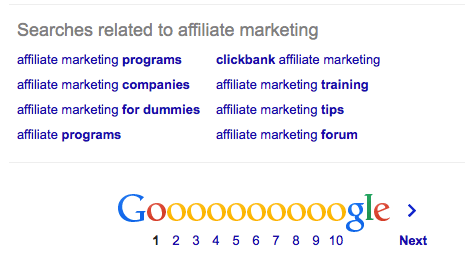 What are the benefits of using the Keyword Suggestions tool? Besides the short introduction above, I will make a specific list with what can you gain from using GeoRanker tool. Increased conversion: relevant content will not only attract visitors, but it will also attract qualified traffic and readers. Your conversion rate will be higher if the content provides meaningful information for the ones that look for your website to read it. Prioritize your time properly: using the not so good keywords means to spend time for nothing. You must know what are the keywords that help you increase your traffic, or convert visitors to buyers or clients. Expand your long tail efforts: using a keyword suggestions tool help you find other queries, then you can expand your long tail keywords. You will see later in this article why you need long tail keywords. Identifying your competition: once you find out who your competitors are, you can work on your website to make it blossom and be more than what your competitors have or even beyond them. Enriching your local SEO campaign: the right keywords will lead you to the first position in top Google pages, therefore you will be the one people read the most and want the most. Boost your Google Adwords Campaign: a Google Adwords Campaign need the best keywords to give you back new website visitors, grow your online sales, or keep the customers or readers to turn back for more. How GeoRanker Keyword Suggestions tool works? First of all, you have to make an account to use GeoRanker’s tool. Hit the “Create Account” button, then fill the form. 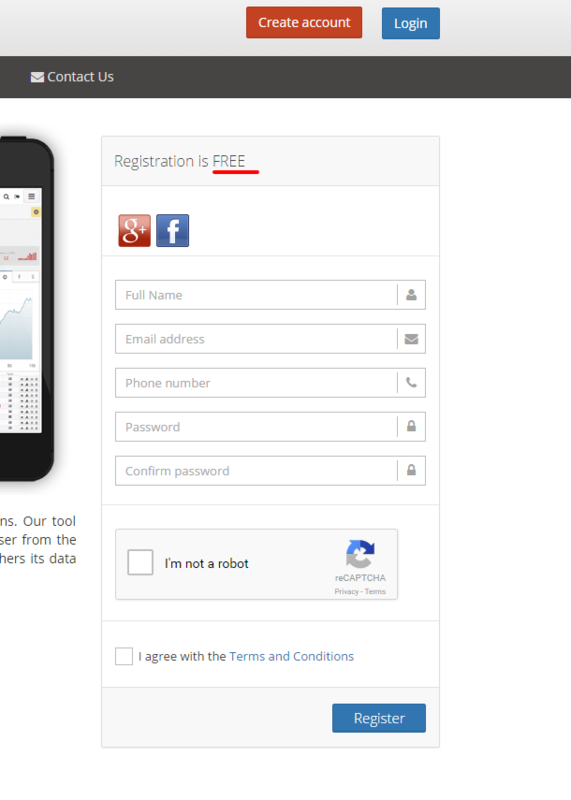 By the way, creating the GeoRanker account is free as you can see in the next picture. After you get into your account, you will see that you have 500 free credits to use, the possibility to generate a report for each credit you use, while you can monitor and getting announced by alerts. First of all, this is the page you will see after you hit the “Keyword Suggestions” button. This is the section dedicated to GeoRanker tool. Once again, you can clearly see that you have 500 free credits to use. Let’s take a closer look at the panel. We can see a RankTracker button and a Keywords Density one. These tools are there to help you together with the Keyword Suggestions tool. The RankTracker tool helps you check how keywords found with Keyword Suggestions ranks on your website in a specific location, while Keyword Density tool checks the density of keywords in the content provided on your website. I suggest you use all of them because they are critical in the process of increasing your website traffic or sales. Now that you are here, before starting a keyword research using our tool, it’s important to start from a list of general keywords. You must write a list of keywords related to your business or related to the main topic that your website or blog is built on. You don’t have to dig out your mind for complicated keywords, just think about those words that describe, at a first thought, your website or online business. Open the Keyword Suggestions tool and type in the text box the keywords you want to look for. Let’s take, as an example: local SEO citations. You type the keyword in the text box. GeoRanker has a huge advantage in front of others Keyword Suggestions tools: it uses local IPs for queries and for finding the keywords you need. More exactly, after you typed the keyword in the text box, you can select the zone wanted. I chose United Stated, as an example, but you are free to select any zone you want. As you can see, you can export the report and have it on your computer to check it every time you need. You can save it as a PDF, CSV, MS Excel or as a simple Image. It’s your choice. 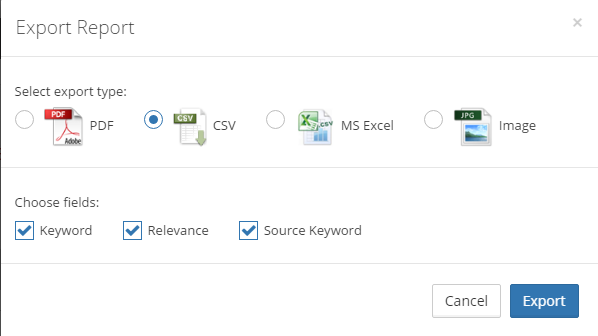 The report contains the keywords you should use, the relevance and the source keyword. The relevance means the popularity of that keyword or the qualitative measure of the importance of a keyword segmentation. Since the relevance is big, the keyword is important. That means it can lead readers or possible buyers to your blog or website. Therefore, your main goal, increasing the traffic or sales, is achieved. I bet you have seen many times the “Searches related to” at the bottom of the Google page. They are long tail keywords that people uses when they look on Google for something. As I said in the first part of the article, people uses Google not as a search engine anymore. They act like they are talking to a human being asking them for information for something they want to know, or buy. If they want to look for a direction to a specific location, or any type of information. 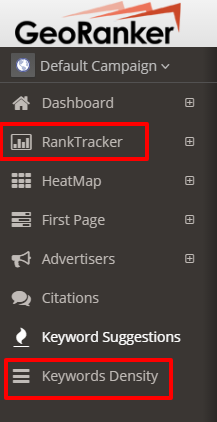 If you want more than this, GeoRanker helps you to see how a keyword is ranked by using RankTracker tool, and offers you the Keyword Density tool to check the density of your keywords on your website. 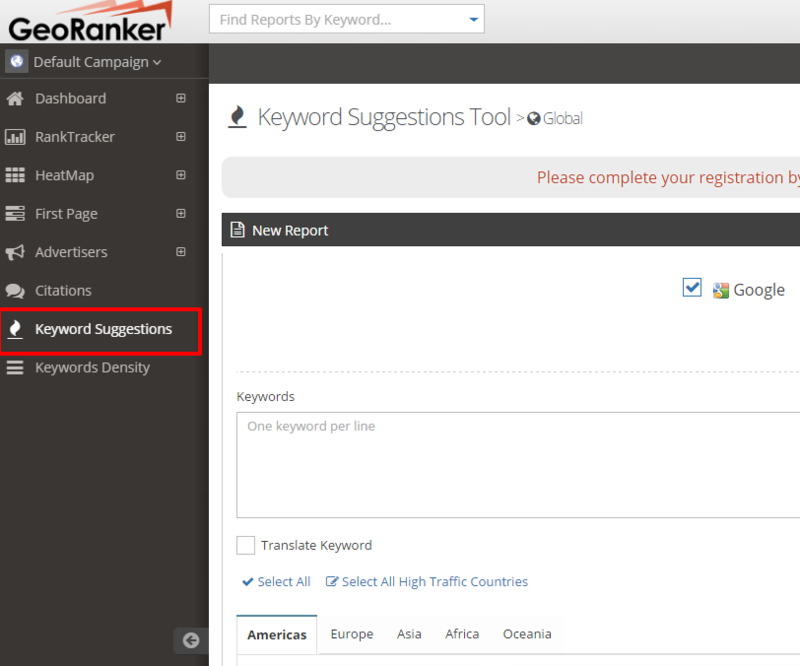 You can find them in the left panel of your GeoRanker account – the same panel where you find Keywords Suggestions tool. You have another two GeoRannker tools that can help you increasing traffic and sales on your blog or website. Keywords mean your website or your online business life. Without them or without using them properly you will be on the second page of Google and people won’t find you. Take care of your website and if you need help, you can always make an account and let us help you.